This time we will go through ARM Cortex-M3 LPC1343 ADC programming tutorial. We will see how to convert an Analog signal to its Digital version. 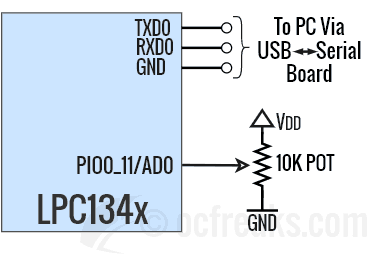 We will also see LPC134x basic ADC Interfacing Example along with an interrupt based example. Analog to Digital Conversion is used when want to interface an external analog signal or when interfacing analog sensors, like for example a temperature sensor. The ADC block in ARM Cortex-M3 LPC1343 Microcontroller is based on Successive Approximation(SAR) conversion method. LPC1343 ADC Module uses 10-bit SAR having a conversion time of >= 2.44us i.e. around 409Khz max convertion rate. The Measurement range is from 0V to VDD, or commonly from 0V to ~3.3V (3.6V max). Maximum of 8 multiplexed inputs can be used for ADC. Note that LPC134x devices do not have any dedicated Analog voltage supply (VDDA & VSSA) pins nor does it have any dedicated Voltage reference input pin (VREF). It uses VDD & VSS as Analog Voltage supply inputs and VDD as Reference Voltage for ADC module. AD0 to AD7 (PIO0_11, PIO1_0/1/2/3/4/10/11) Analog input pins. VDD (VREF) VDD itself is used as reference voltage pins for ADC block. VDD, VSS VDD is Analog Power pin and VSS is Ground pin used to power the ADC module. Lets see registers which are used for ADC programming. 1) ADCR – A/D Control Register : This is the main control register for ADC Block. Bits[7:0] – SEL: Bit ‘x'(in this group) is used to select pin ADx. Bits[15:8] – CLKDIV: ADC Peripheral clock i.e. PCLK(same as PCLK for lpc134x) is divided by CLKDIV+1 to get the ADC clock. Note that ADC clock speed must be <= 4.5Mhz! As per user manual user must program the smallest value in this field which yields a clock speed of around 4.5 MHz or a bit less. Bit – BURST: Set to 1 for doing repeated conversions, else 0 for software controlled conversions. Note: START bits must be set to 000 when BURST=1 or conversions will not start. Refer user manual for detailed info. Bits[19 to 17] – CLKS : These bits are used to select the number of clocks used for conversion in burst mode along with number of bits of accuracy of the result in RESULT bits of ADDR. Bits[26:24] – START: These bits are used to control the start of ADC conversion when BURST (bit 16) is set to 0. 0x0 = No start , 0x1 = Start the conversion now, and rest(0x2 to 0x7) of the values are used to start conversion when edge selected by bit 27(given below) occurs on a corresponding pin – refer LPC13xx User Manual for more. 2) ADGDR – A/D Global Data Register : Contains the ADC’s flags and the result of the most recent A/D conversion. Bits[15:6] – V_VREF (RESULT): When DONE bit = 1, these bits give a binary fraction which represents the voltage on the pin ADx, divided by voltage in VDD. Value of 0x0 indicates that voltage on the given pin was less than, equal to or close to VSS(i.e. GND). And a value of 0x3FF means that the input voltage was close to, equal to or greater than the VDD. Bits[26:24] – CHN: Represents the channel from which V_VREF bits were converted. 0x0 = channel 0, 0x1= channel 1 and so on. Bit – OVERRUN: In burst mode this bit is 1 in case of an Overrun i.e. the result of previous conversion being lost(overwritten). Bit – DONE: When ADC conversion completes this bit is 1. When this register(ADGDR) is read and ADCR is written, this bit gets cleared i.e. set to 0. If ADCR is written while a conversion is in progress then this bit is set and a new conversion is started. 4) ADDR0 to ADDR7 – A/D Data registers : This register contains the result of the most recent conversion completed on the corresponding channel [0 to 7]. Its structure is same as ADGDR except Bits[26:24] are not used/reserved. 5) ADSTAT – A/D Status register : This register contains DONE and OVERRUN flags for all of the A/D channels along with A/D interrupt flag. Bits[7:0] – DONE[7 to 0]: Here xth bit mirrors DONEx status flag from the result register for A/D channel x. Bit 16 – ADINT: This bit represents the A/D interrupt flag. It is 1 when any of the individual A/D channel DONE flags is asserted and enabled to contribute to the A/D interrupt via the ADINTEN(given below) register. 6) ADINTEN – A/D Interrupt Enable Register : Using this register interrupts can be enabled or disabled for any ADC channels. Bits[0 to 7] – ADINTEN[7:0]: If xth bit is set to 1 then an interrupt will be generated on completion of A/D conversion on channel x. Similarly if this bit is set to 0 then an interrupt wont be generated. Software controlled mode : In Software mode only one conversion will be done at a time. To perform another conversion you will need to restart the process. In software mode, only 1 bit in the SEL field of ADCR can be 1 i.e. only 1 Channel(i.e. Pin) can be selected for conversion at a time. Hence conversions can be done only any channel but one at a time. Hardware or Burst mode : In Hardware or Burst mode, conversions are performed continuously on the selected channels in round-robin fashion. Since the conversions cannot be controlled by software, Overrun may occur in this mode. Overrun is the case when a previous conversion result is replaced by new conversion result without previous result being read i.e. the conversion is lost. Usually an interrupt is used in Burst mode to get the latest conversion results. This interrupt is triggered when conversion in one of the selected channel ends. First, lets define some values which will help us in setting up ADCR register to configure & Initialize ADC block. Note that before setting ADC using ADCR the ADC block must be powered-up using PDRUNCFG register and ADC Clock must be enabled using SYSAHBCLKCTRL register. while((LPC_ADC->DR0 & ADC_DONE) == 0); //this loop will end when bit 31 of AD0DR6 changes to 1. Note that in this case we can select multiple channels for conversion when setting up AD0CR. START bits are not applicable here since the conversions starts as soon we setup AD0CR register. To select AD0 function for pin PIO0_11 we just need to set FUNC bits[2:0] to 0x2 and set the ADMODE bit to 0. In latest(current) versions of CMSIS library the member R_PIOO_11 of LPC_IOCON is used as LPC_IOCON->R_PIO0_11 = 0x2; but in older versions of CMSIS (used by CoIDE[as of now]) R_PIO0_11 was defined as JTAG_TDI_PIO0_11. Hence in this case you will have to use LPC_IOCON->JTAG_TDI_PIO0_11 = 0x2;. Newer versions of CMSIS included in LPCXpresso and MCUXpresso support both of them but KEIL doen't support LPC_IOCON->JTAG_TDI_PIO0_11. So just keep this in mind while programming in KEIL or CoIDE. Note that in this case no input protection nor filtering was required. But, when Interfacing external analog signals it is recommended to use some form of input protection. #include "ocf_LPC134x_lib.h" //contains code for UART, Timer & to retarget printf(). //LPC_IOCON->JTAG_TDI_PIO0_11 = 0x2; //Older version of CMSIS uses this. Uncomment this for CoIDE. ocf_lpc134x_lib.c header used in project also contains code for retargeting printf() over UART for LPCXpresso/MCUXpresso. The project for CoIDE contains separate printf.c to retarget printf() using UART. Now, lets cover an example using Hardware controlled mode or Burst mode using ADC Interrupt. In this mode we will have to use ADC interrupt since the ADC block will scan the selected channels and generated interrupt when a conversion gets finished on a particular channel. It scans the channels in round-robin fashion. In this example too, we will use PIO0_11(P0.11) for measuring the voltage. The connections are same as given in example 1. The ADC ISR ADC_IRQHandler() gets called everytime conversion is finished on selected channel.